The condition of the boat is very good. It does have dock rash on both sides, but the fiberglass is not gouged or scarred. It appears to have come from rubber docking bumpers rubbing the side of the boat. The trailer is in good condition with one dent on the left rear step by the taillight assembly where the trailer has backed in to something. The engine is extremely clean. 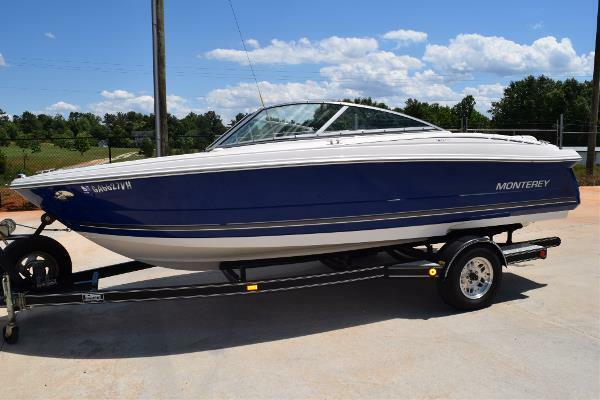 Stock #175110 180 FS powered by a 4.3L Mercruiser V6, plenty of power for all your water sport fun! 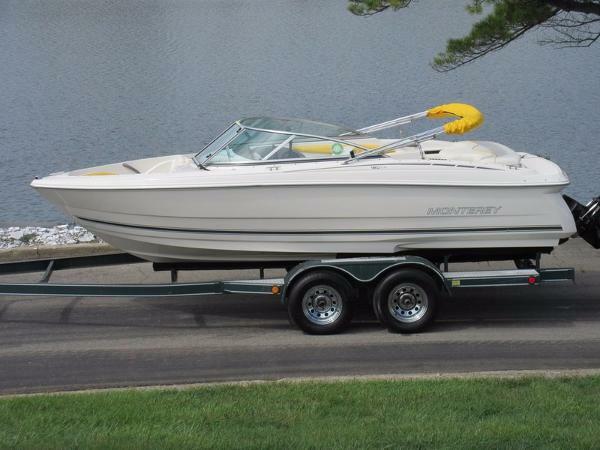 If you are in the market for a bowrider, look no further than this 2009 Monterey 180 FS, priced right at $22,750 (offers encouraged). 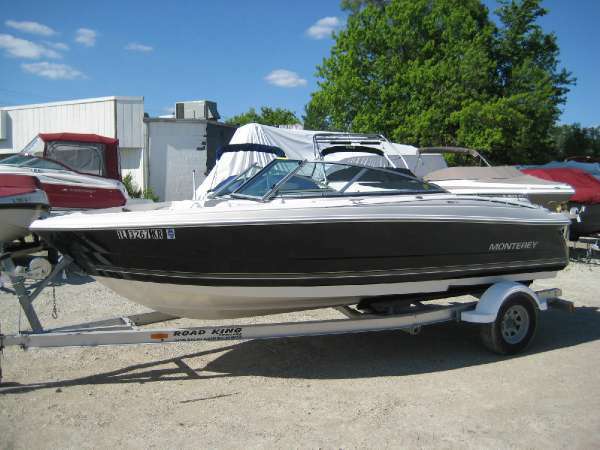 This boat is located in Jonesborough, Tennessee and is in great condition. She is also equipped with a Mercruiser engine that has only 101 hours. Reason for selling is lack of time. 2007 Monterey 180 FS Fun and value that will take your breath away. The new 180 FS offers sporty performance and stylish good looks to provide you with non-stop fun on the water. The integrated fiberglass cockpit contains ample drink holders and comfortable seating all around for an unbeatable boating experience. The 180 FS has it all! - Very Nice Boat! Spotless! 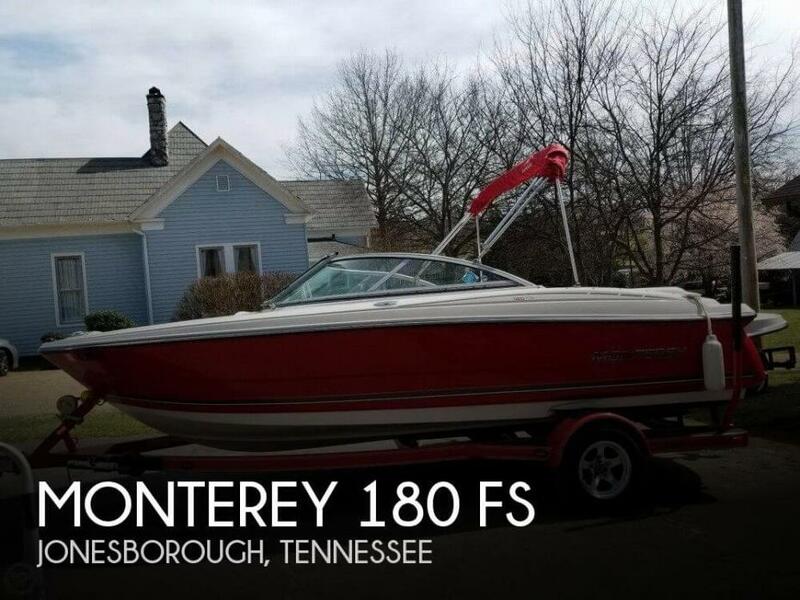 2009 Monterey 180 FS One owner, very low hours, 3.0 liter 4 cylinder, 130 HP. , runs out at 40MPH and just sips the gas!!! Only burns 3 gallons per hour !!! Fiberglass floor, sunbrella top, cockpit and bow cover, full gauges, lots of storage, seating for 8, also comes with a very nice custom trailer. This is a nice one! 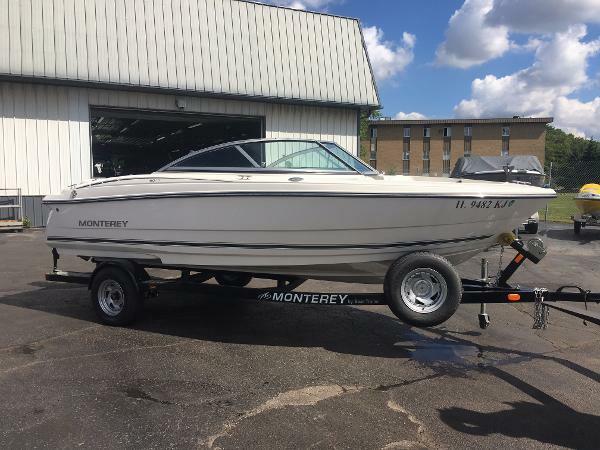 2007 Monterey 180FS 2007 Monterey 180FS 18' Bowrider, Runabout, 4.3L V8 Mercury MerCruiser Engine, MerCruiser Alpha One Outdrive, 7' 8'' Beam, Dry Weight 2500LB, Fuel Capacity 28 Gallons, 8 Persons or 1300 LBS Capacity, 1500 LBS Persons and Gear, only 20 Hours. The integrated fiberglass cockpit contains ample drink holders and comfortable seating all around for an unbeatable boating experience. 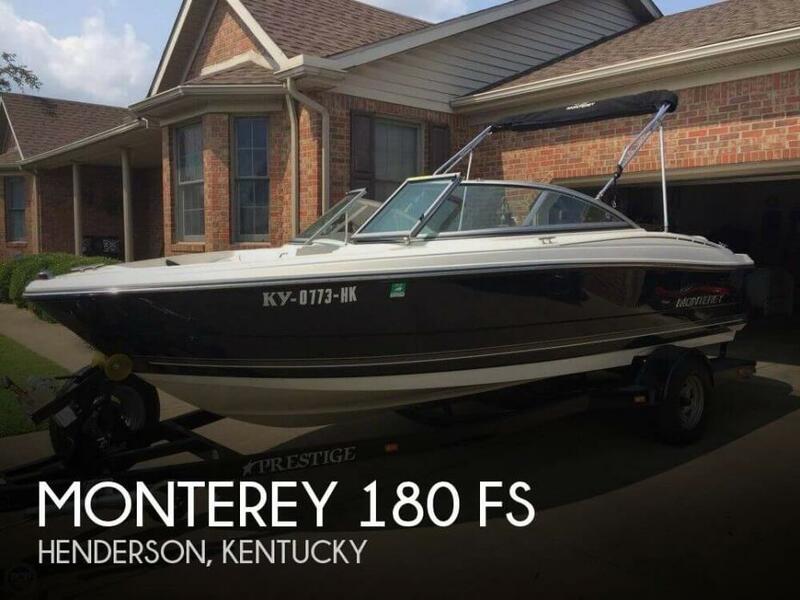 2008 Monterey 180 FS Freedom, excitement and adventure are just a few ways to describe the voyages you'll soon be taking with your 180FS. This sport boat's intelligent use of space for lounging and storing gear makes for a spacious and comfortable ride. - A great bowrider for any adventure! 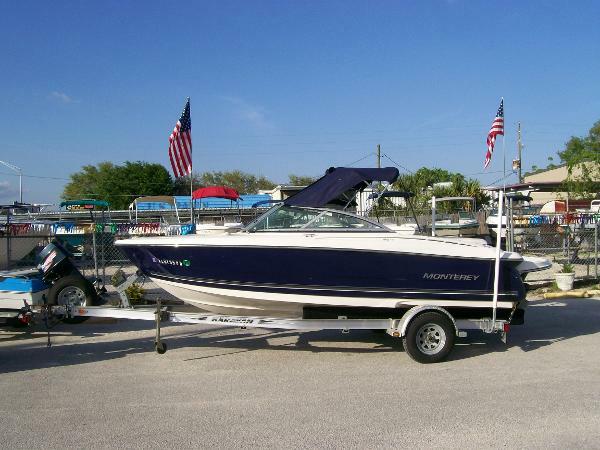 2006 Monterey 180FS 2006 Monterey 180FS Very Nice Monterey 180FS with 190 h.p. 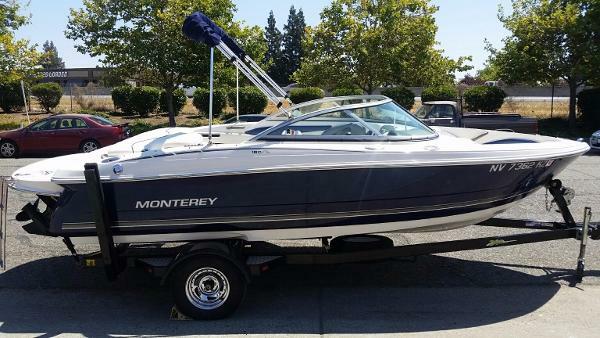 Mercruiser Nice Monterey 180FS Bowrider powered with an upgraded 190 h.p. Mercruiser 4.3L. 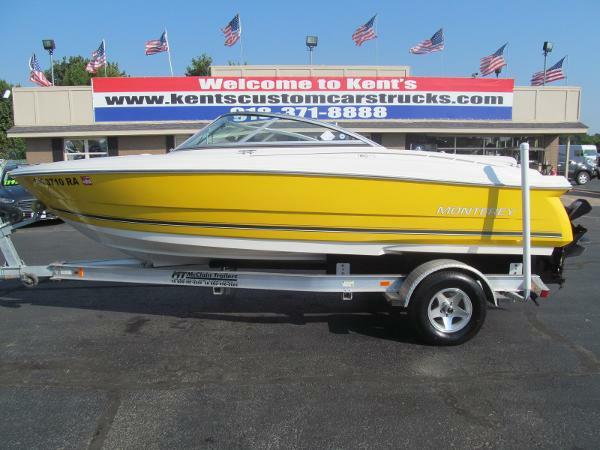 Comes with: large ski locker, stereo/cd, custom cover, bimini top, tilt wheel, swim deck w/ ladder and More. 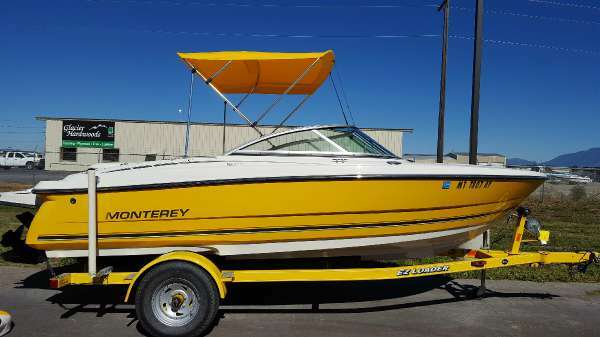 2007 Monterey 180FS We are offering a very, very nice Monterey 180 FS in exceptional condition. Positioned high in the industry this is a quality boat with superb fit, finish, quality materials and attention to detail. 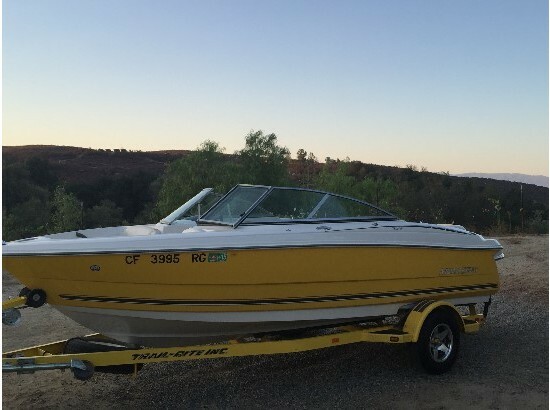 The 180 FS is a big boat for an 18 footer and could be easily mistaken for a 19' or 20' boat. The wider beam and high free board provide a roomier cockpit and an added measure of safety that is tangible when you climb inside her. This is an ideal configuration as well with a drivers bucket seat W/flip bolster, back to back port lounge seat and adjustable rear seats...perfect for this size boat. Come and take a look I promise you will not be disappointed. 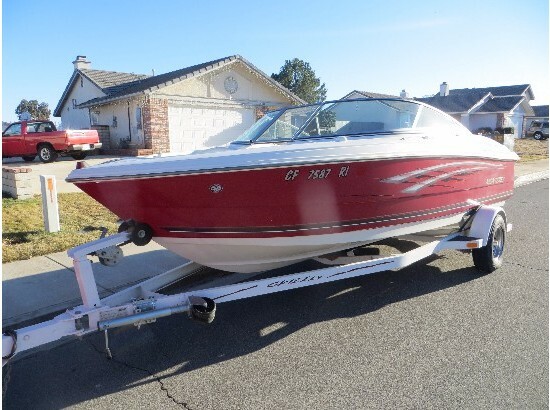 Features & equipment include; Mercruiser 4.3L V/6, Alpha I out drive W/spare prop, extended swim platform W/ss boarding ladder, bow cover, cockpit cover, bimini top W/quick disconnect hardware, upgraded sound W/Clarion CD & aux, kicker amp, JBL & Memphis Audio cockpit speakers, on/off battery switch, depth finder, SS package (rub rail, 4-pull up cleats, ski tow, boarding ladder, drink holders), single axle trailer W/disc brakes, spare tire, swing tongue & side guides. All of our boats come with a 30+ point inspection! 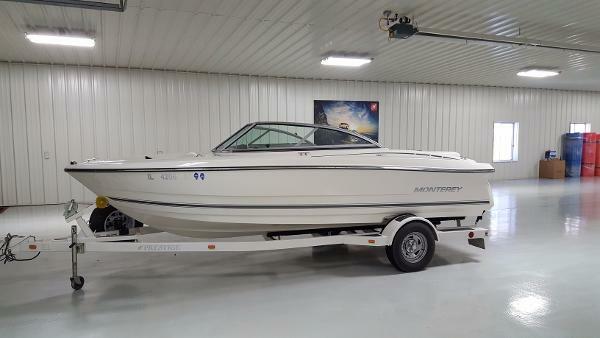 2005 Monterey 180 FS Bow Rider Mercruiser 4.3L Alpha Road King Aluminum Trailer Stainless Steel Prop - VERY CLEAN! 52 Miles Per Hour!! 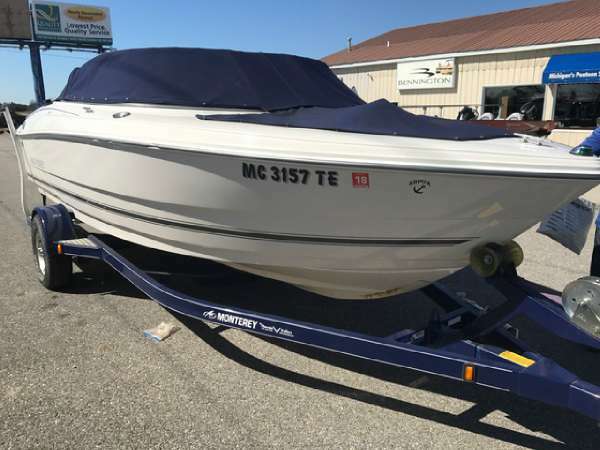 2008 Monterey 180FS Freedom, excitement and adventure are just a few ways to describe the voyages you'll soon be taking with your new 180FS Sport Boat. Unlike many 18-foot bowriders, the 180 Air Assist Chine makes this vessel a top performer, while its 7-foot, 8-inch beam and intelligent use of space for lounging and storing gear make for a spacious and comfortable ride. Agile and nimble, the power-packed 180FS boasts sleek lines and fluid curves, and is loaded with amenities waiting to be embraced. 2010 Monterey 180FS Very clean boat with only 40 hours! This boat is equipped with a travel cover, depth sounder and JBL stereo.